As published in the Murray Valley Standard. Photo: Gather: Eugenia Tsoulis, OAM, CEO of the Australian Migrant Resource Centre (AMRC), Murray Bridge Mayor Brenton Lewis, President of Overseas Chinese Association SA Mr Yong Koh and President of Murray Bridge Chinese Association (MBCA) Mr Morong Xu (photo courtesy of Murraylands MRC). A large community gathering, of around 140 people, took place in Murray Bridge over the first weekend of September. Guests were welcomed by Mayor Brenton Lewis, Rural City of Murray Bridge; Mr Yong Koh, President of the Overseas Chinese Association (OCA); and Eugenia Tsoulis OAM, Chief Executive Officer of the Australian Migrant Resource Centre (AMRC). The event was hosted by Murraylands MRC in partnership with the OCA, as guests of Chinese, Filipino, Burmese and other backgrounds gathered together and shared in a barbecue. During the event, the OCA introduced their ethnic school which offers Chinese classes to local Murraylands residents. 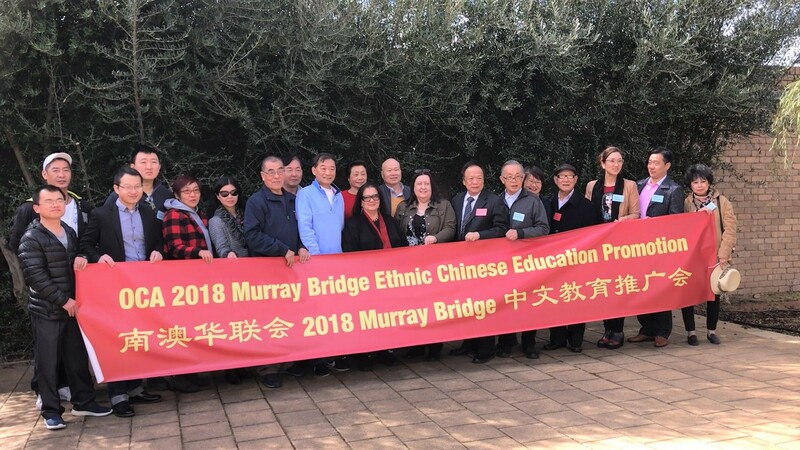 Photo: Proud: A group of attendees held up a banner emblazoned with Murray Bridge Ethnic Chinese Education Promotion (photo courtesy of Murraylands MRC).